We have over 10 years of experience in delivering great products and services. We manufacture all types of pool covers using the best Australian/600 micron material exclusive to Soltex, fixed/retractable awnings and sun blinds and roller vertical blinds, all at surprisingly low prices. Couple this with our top-notch customer service and you have an unbeatable combination. For advice and a free quote call James on: 626 778 205 or fill in our contact form with your requirements and we will be in touch with you as soon as possible. A great service and really happy with the workmanship and the difference it made to our business. The quality of work and service was truly outstanding. A pleasant attitude, not only during installation but also with the afterservice care. SolTex is the firm to use for value for money and a safe feeling. 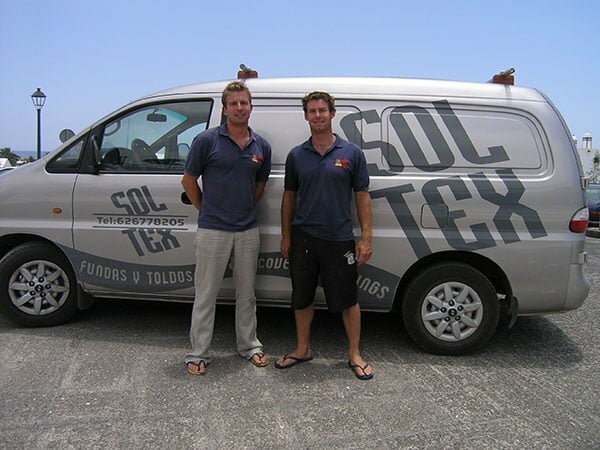 At Soltex we manufacture all types awnings and sun blinds in all sizes for many different uses. We are specialists in the use of awnings in Lanzarote’s unique climate. Howling winds and harsh sun are the norm on the island so you can be guaranteed that with our experience you will not be let down. All our materials are tried and tested to be the strongest and most reliable available. We only use stainless steel fixings. These are great for closing off outside areas to protect you against the wind and to give you increased privacy. These make an outside area usable all thought the year. You can also complete shut of an outside area to make an outside room. It is also much more affordable and more practical than having glazed/wooded doors and windows made.